The Digium S110M FXS module allows you to connect an additional analog telephone to your existing TDM400, TDM410, TDM800 or AEX800 board. Because of the modular design, a user can activate additional ports at any time with more S110M or X100M daughter cards. The S110M module passes all the call features any standard analog telephone line will support. 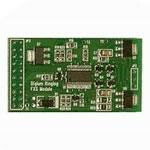 The Wildcard TDM400P family is a half-length PCI 2.2 compliant card that supports from one to four telephone interfaces for connecting analog telephones or analog lines to a PC. Using Digium Asterisk PBX software and standard PC hardware, one can create a SOHO (Small Office Home Office) telephony environment that includes all the sophisticated features of a high-end business telephone system. The TDM400P family takes the place of an expensive channel bank and brings the system price point to a low level. By using Digium S110M FXS modules with the TDM400P family, one can create a solution with support for a range of telephones. To scale this solution, simply add additional TDM400P family cards populated with modules. In order to meet shipping schedules for our customers, Digium has developed two matrices of TDM bundles. The first Standard Configurations will be kept in stock, on shelf, and ready for shipping. The second, "Non-Standard Configurations,will be subject to a 5 business day shipping delay. We apologize for any inconvenience this may cause. The naming convention for the TDM bundles is as follows: TDM X Y B. Where TDM denotes that the card is TDM denotes the number of FXS modules denotes the number of FXO modules, and indicates that that this product is a bundle.